Social engineering is the art of accessing information, physical places, systems, data, property or money by using psychological methods, rather than technical methods or brute force. Request your a free copy of B.F. Saul Insurance - Risk Insights "Social Engineering" whitepaper. While many businesses invest large sums of money into building sound physical structures and robust IT systems or even hiring on-site security guards, they often overlook the biggest vulnerability—people. No matter how dependable security systems might be, people with authorized access to those systems will always be a vulnerability. That’s why criminals have begun employing a series of tactics called “social engineering” to convince people to give them access—something that costs companies billions each year, and is completely preventable. 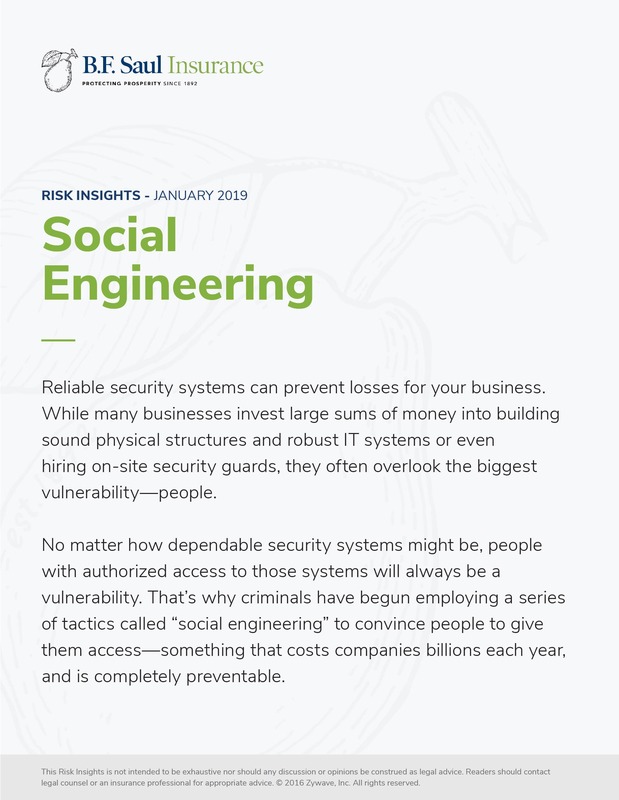 Learn more about the risks posed by social engineering, request a copy via the form below.